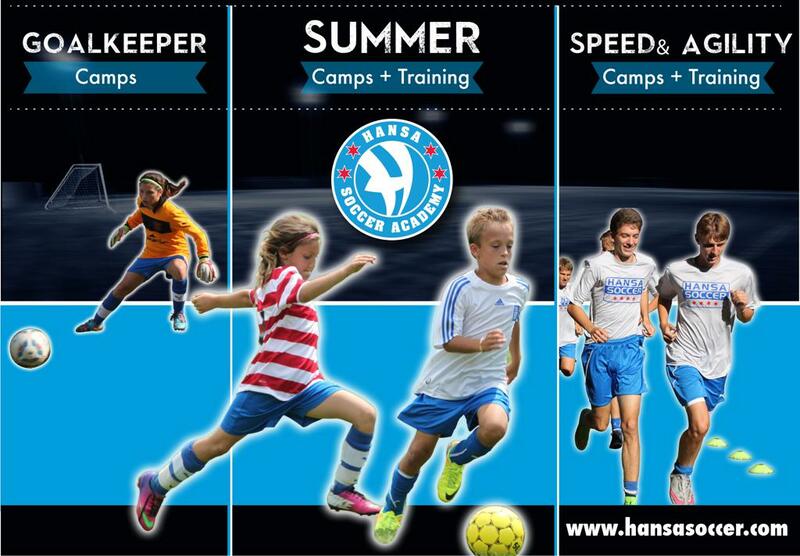 At Hansa Soccer Camp, you will develop new skills to play and enjoy the game of soccer. The camp curriculum is designed to help develop players to gradually master simple to more complex ball skills as well as learn individual to more complex group tactics. Our teaching method is based on small sided game play (game based learning). Our professional and licensed coaches will guide this progression with enthusiasm in an ethical and knowledgeable way. Players should participate at a level that is challenging and demanding for their ability. Every opportunity will be provided for a player to reach his or her potential. Within this progression players will develop responsibility for their own performance, learn the concept of team sport and learn life lessons. Our goal is to keep the passion for soccer a life long endeavor that will keep a player healthy for their lifetime. Hansa Coaches focus on technical, tactical, physical and psychological requirements of the game at each age level. But more importantly, they focus on the child as an individual and not just as a player on a team. Players will be split up into 3-5 age appropriate groups depending on the amount of players. Coaches will evaluate all players in our first session on Monday morning of each camp week and make adjustments based on level. Adjustments are at the discretion of Hansa staff coaches. We offer lunch, sports drinks and healthy snacks between sessions. The program includes two t-shirts, a pair of shorts and a pair of socks for each participant. There are surprises in store every camp, including soccer giveaways. At Hansa Camp you will play an internal World Cup in real uniforms of the best soccer nations in the world. The best team wins a miniature Hansa World Cup Trophy. Come and explore the passion of the game! Hansa camps are open to all players that would like to improve their soccer skills to reach the next level of their game. These are not babysitting or day care camps. Cancellations of full day and shortening of camp day due to weather conditions will not be refunded. REGISTRATION OPENS JAN 15TH - CLICK THE WEEK YOU WOULD LIKE TO ATTEND BELOW. REGISTER BY CLICKING THE WEEK YOU WOULD LIKE TO ATTEND BELOW. Early Bird Pricing - Jan 15th - Jan 31st no additional discount eligible during this time. ***DISCOUNTS USING A CODE ARE ONLY ISSUED AT THE TIME OF REGISTRATION AND AMOUNTS WILL NOT BE CHANGED RETROACTIVELY. Group Discount - $40 Off each registration if you are part of a group of 5 or more players attending the same camp week. The group discount can only be used if you communicate the groups via email BEFORE registering the group members. Once a group is established NO player can be added retroactively. Please call 773-366-6640 BEFORE registering the group members to receive instructions. This discount can only be combined with the multiple weeks discount when registering for more than one week of full day camp. A friendly reminder that pick up time is 4PM sharp (Fridays at 2pm). If you know you will be late you must contact the camp director 24-hours BEFORE the late pick-up to confirm whether it is possible to have staff available to work for the additional time (doc1@hansasoccer.com, 773.366.6640). There will be a fee charged for this after care. The Hansa Soccer Camp ends Monday to Thursday at 4:00PM and Friday at 2:00PM. Due to late pick ups a late fee policy has been established. Please understand that when a parent/guardian is late picking up their child, we must have at least one instructor remain at the site for the safety of your child. These instructors must be compensated for their time and this can ultimately cause an increase in our program fees for everyone. -A $20 late fee (per child) is charged for the first 15 minutes after the program closes. -An additional late fee of $20 will be charged for the next 15 minutes. For example, if a parent arrives at 4:16PM, he or she will incur an additional $20 late fee, total fee is now $40 (per child). -***Late fee is to be paid immediately upon your arrival;failure to pay can result in termination from the program. -If after 45 minutes Hansa instructors have not been contacted and are unable to reach a parent or guardian who is available to pick-up your child, the township police department may be contacted. -Time is determined by the time on the camp director's iPhone.